Campus was first divided in 1945, following the Allied victory in World War II. WESTWOOD—Declaring that South Campus is the only true campus, members of the South Campus Confederation ran military training exercises near the North Campus border on Saturday. The exercises started with a test bombing run on Janss Steps, followed by hundreds of physics majors storming through Dickson Plaza and a staged amphibious assault from North Pool by engineering majors. With emotions already running high after a South Campus surveillance drone was shot down in North Campus territory last week, the exercises have exacerbated tensions between the two Campuses. They also come right before a planned North-South Summit scheduled for Wednesday. Many independent analysts predict war is imminent between the two campuses. According to recent reports, the engineering department is developing a nuclear bomb that would be capable of completely leveling North Campus by 2017. 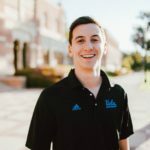 UCLA administrative intelligence also reports that North Campus is developing their own unorthodox plan: Sending girls to South Campus to instantly scatter all the South Campus majors and neutralize potential threats. When asked about his thoughts on the potential of war, Chancellor Gene Block stated: “Let them fight.” before draping himself in his cloak, taking two dramatic steps backwards, and melting into the shadows.